This tense is often very confusing to speakers of other languages besides English. In many languages the present tense is used and the time is added to indicate the past. For example, in Chinese, the verb never changes regardless of the time. Other languages have markers (Vietnamese is one such language). In English, verbs are used mostly to set the time. Past present and future. In this lesson we are going to look at The Past Simple Tense. An action which began in the past, and finished in the past. The 'past' is any time before we are speaking or before a specific time we are talking about. We have verbs which represent different aspects of the past, but in this lesson we are only going to focus on the past simple. When 'we', as native speakers learnt tenses, we learnt them in 'threes' so we are going to do the same with you. Threes = Present > Past Simple > Past Participle. 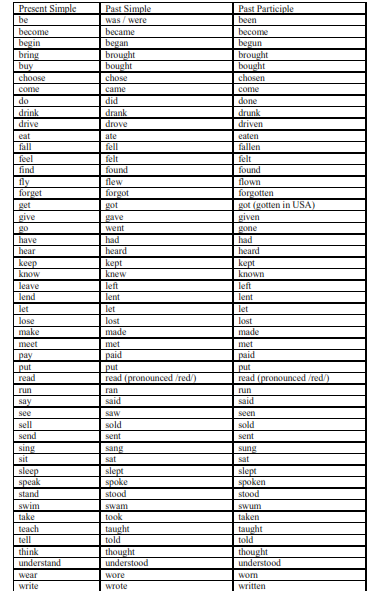 The chart above shows only 'irregular verbs'. We are going to break this section into the two different types of past simple verbs. These are verbs which do not have a regular pattern for the spelling. These are more difficult to learn because of this. Common verbs used are: had(have) went(go) was(is) did(do) came(come) got(get). To show the indication of 'past time' we will do some examples. 1.- The man went home after work. 2. - We bought some new clothes. 3. - The children ran all day. 4. - Germany won The World Cup. 5. - Donald Trump became President of the USA. All of the verbs in the sentences tell us that the actions happened in the past. The only thing we do not know is 'when' they happened. We can talk about things which happened in the past without 'time' but we more often use a 'time' indicator to say 'when' the things happened. As an example, the sentence "Germany won The World Cup" has to have a time indicator because Germany have won the cup 4 times. So we don't know which time the speaker is talking about. So we add a time element to make it clearer. "Germany won The World Cup in 2014" so we know the action happened in the past, and we also know when. The most important aspect is that the VERB shows the time (past present or future), any other information is to give a more accurate time, so the listener or reader knows exactly the time we are talking about. If I said to my friend "James went to Paris" - I know that he went to Paris, but when did he go? If he went 10 years ago, why are you telling me now? If he went yesterday is he still in Paris? I he went 3 months ago when did he come back? The listener would be thinking of all of these questions. This is because the information, although in the past, does not give enough information. But we can also use the past tense where we do not need time added. (Look at the legend in the contents for the colour indicators). "Were you ever in The Army?" - "Yes I was"
"Did you get my message?" - "No, I didn't. I missed it. Sorry"
"Which school did you go to?" - "I went to Spring High School"
As you can see, the time is not important in these conversations. These verbs are easier to learn because they all have the same ending. Watch - ed, play -ed, talk -ed, want -ed, complete - ed, provide -ed. The only way to learn these is to learn the groups with the same structures. For verbs with consonant + y we remove the 'y' and add -'ied' eg: worry > worried. For verbs with vowel + y we add -ed eg: annoy > annoyed. For verbs which end in a vowel we simply add 'd' Advance > Advanced. Bake > Baked. The following sentences use 'regular' past simple verbs. I waited for him for 2 hours. Peter and his friends played football on Saturday. They started saving for their holiday. Our flight arrived 20 minutes late. She married her boyfriend last year. Here are 4 exercises to complete for the past simple tense. This is the end of the lesson. Use this lesson to supplement your studies with your teacher.